To me the start of spring is all about green: new green leaves on the weeping willows, green shoots on trees in my garden, green weeds in my garden (!) and lots of green in my diet. Including new season asparagus. Green foods are rich in antioxidants. Green is the colour of the heart chakra, and perhaps unsurprisingly asparagus is great for ensuring good health of your heart. And it has anti-aging properties, and it helps your skin look good, and it helps regulate blood sugar. Asparagus is also a natural diuretic and can help you cleanse and detoxify your body, which Green vegetables can also help to detoxify your body, which is great after months of heavy winter comfort food (not that I was complaining about eating so much at the time). I love eating asparagus in so many ways. It is a staple in quiches, salads, risottos and on barbecues. 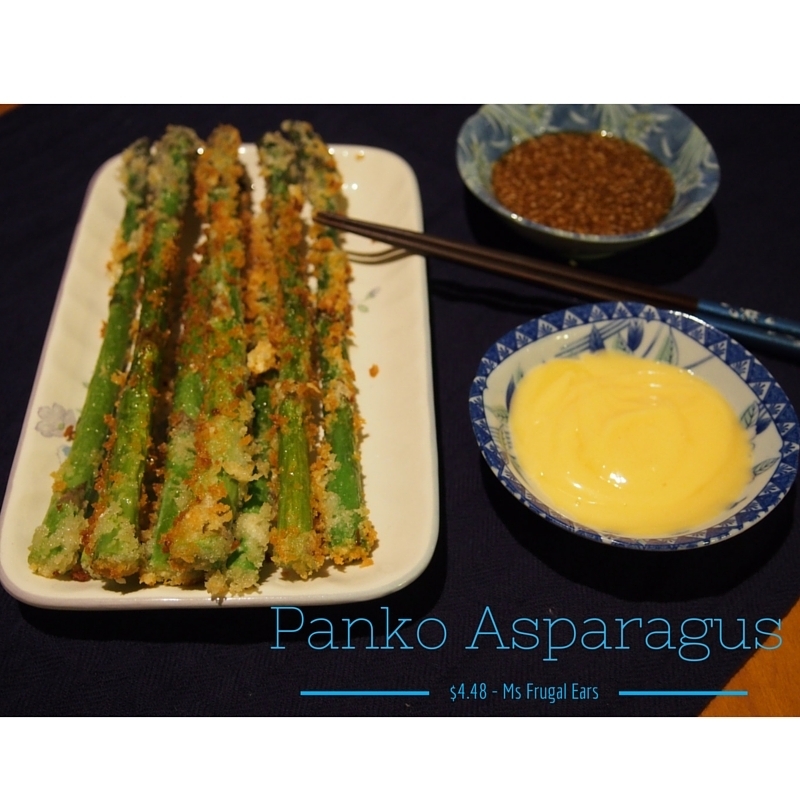 And asparagus is not just a ‘Western’ food; it is popular in Asian cooking as well. 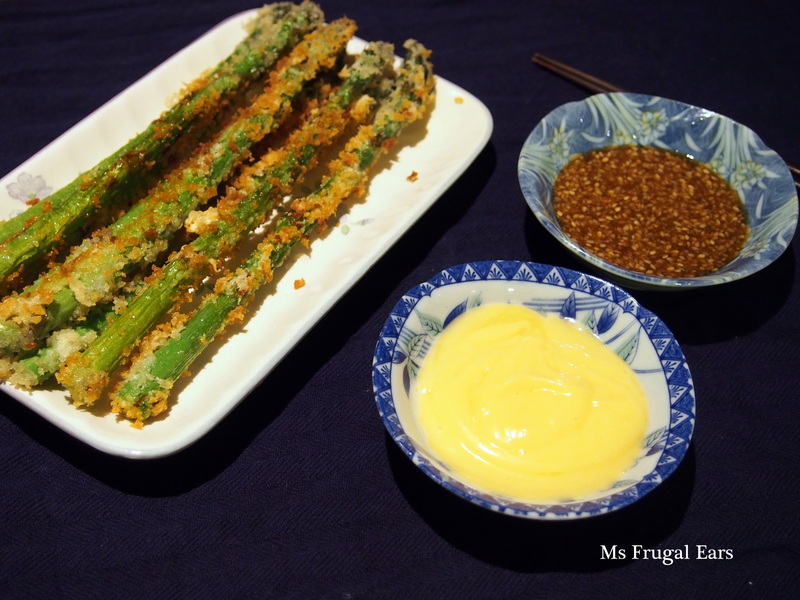 A friend at work shared with me how her Korean mother fried asparagus in panko breadcrumbs. It sounded delicious, and it is truly is. Once you try it served this way you will be hooked. 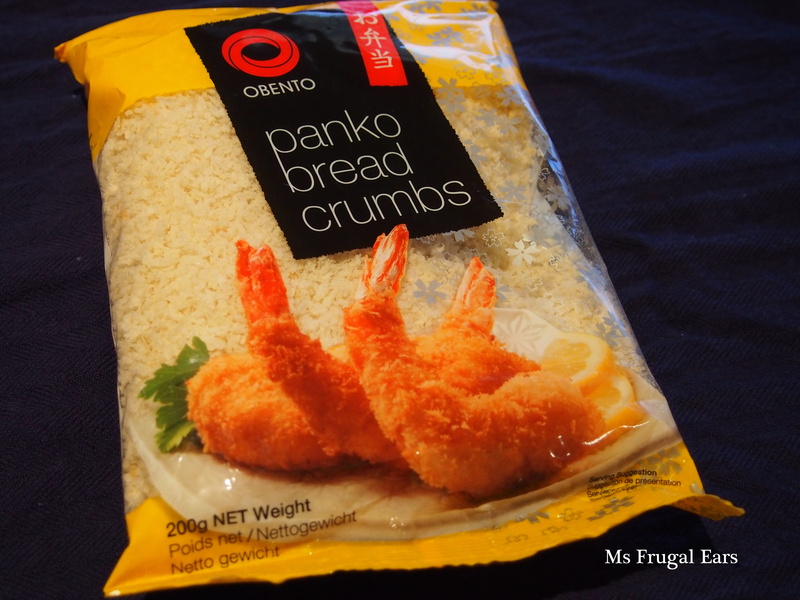 Panko are Japanese breadcrumbs. Substitute homemade soft white breadcrumbs. This recipe is more of an elegant entree or a potluck contribution than a main meal. But serve it with rice and miso soup if you would like to make it more substantial. I have served it here with two dipping sauces. Choose which one or both you like. I found I liked both. I also made around a cup of the mayonnaise as I have found that for some obscure reason it works best with two yolks. Leftovers are great with egg and lettuce sandwiches, or brown bread wrapped around soft-cooked asparagus. 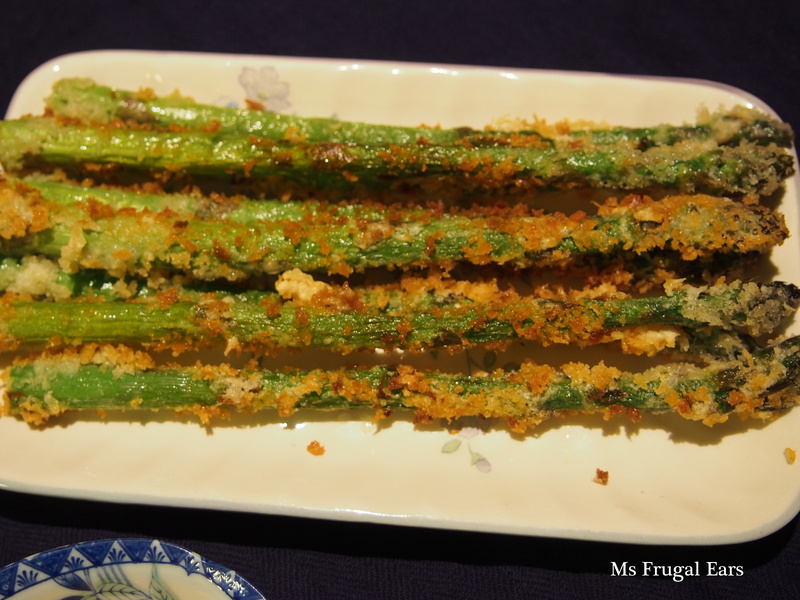 But if you really want an economical version, just serve the panko-fried asparagus with a soy/vinegar dipping sauce. 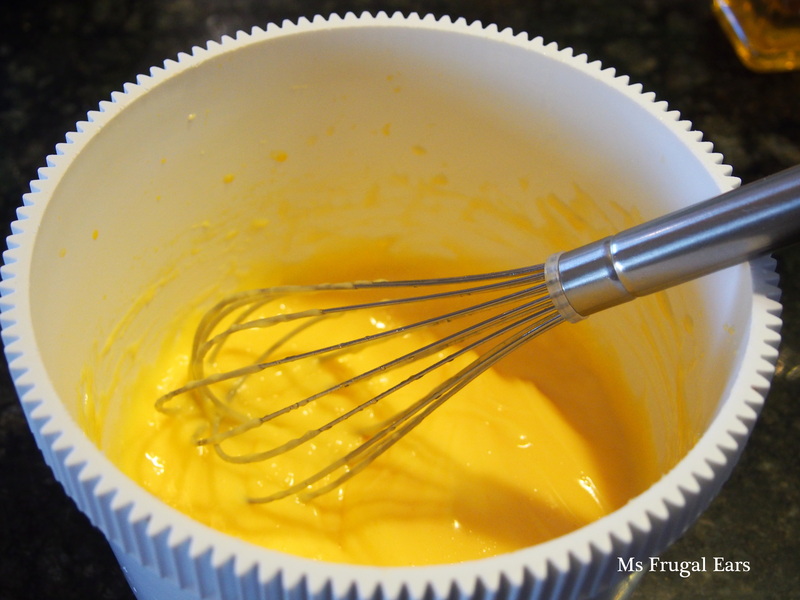 I find it easy to make this with a wire whisk, as it allows you to incorporate the ingredients bit by bit. In the unlikely event that it curdles, beat a separate egg yolk in and add it in small amounts of the yolk until it reaches the desired consistency. Similarly, if the mixture is too thin add more oil. 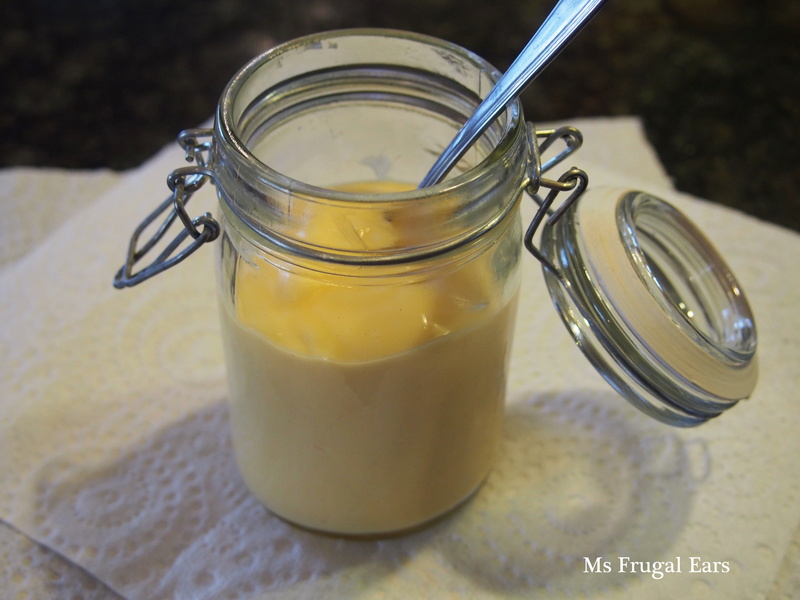 Japanese style mayonnaise, which is slightly sweeter and creamier partly because it uses rice vinegar. This recipe uses much more than you will need, so you will likely have leftovers for sandwiches during the week. Place the egg yolks into a small bowl. 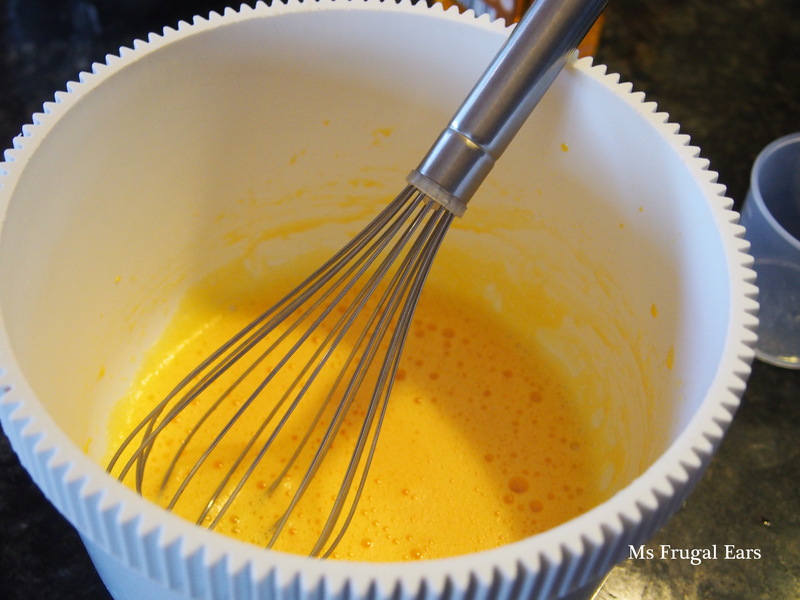 Using a wire whisk, gradually beat the egg yolks and gradually incorporate the rice vinegar. 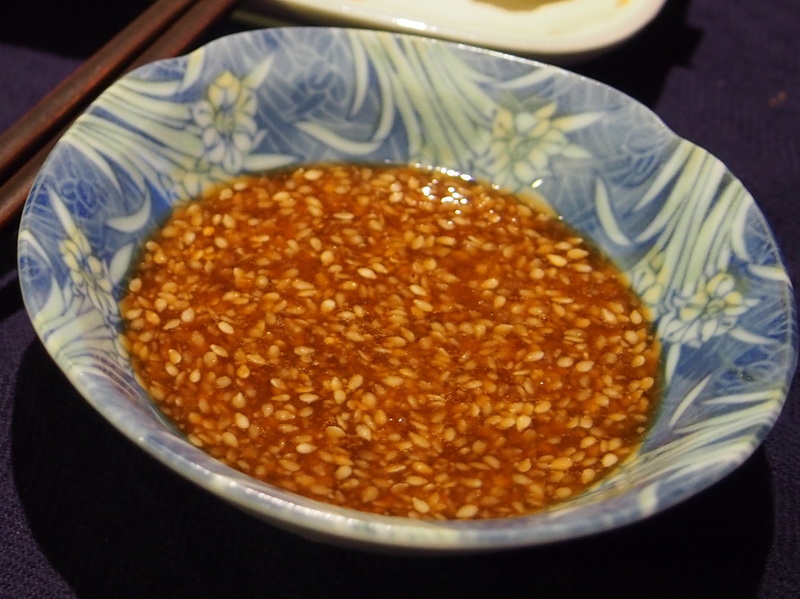 When incorporated, add the salt and sugar and then gradually add the oil until incorporated. Put the sesame seeds into a heavy cast-iron fry pan and roast until almost brown and fragrant. Remove from heat, and place in a mortar. In Japan, they have a special ceramic bowl for this job that has grooves around the sides. 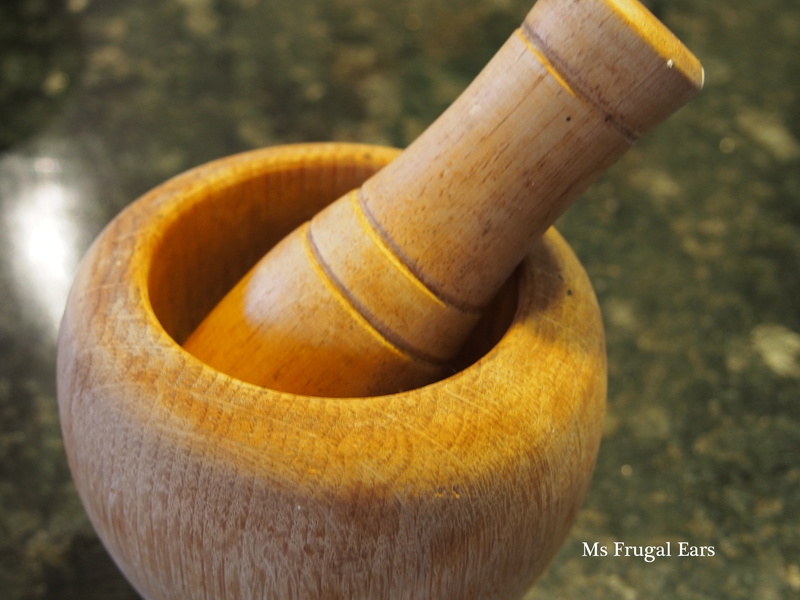 A mortar and pestle does the job almost as well. Grind until fragrant. Combine all ingredients in a glass jar, and shake to combine. Trim the ends off the asparagus. Dip the asparagus into the plain flour. Then dip into a mixture of the egg white, water & salt. Finally, press the asparagus into the panko mixture. Fry immediately in batches in hot oil until the panko is golden brown. I think so … it also really yummy.